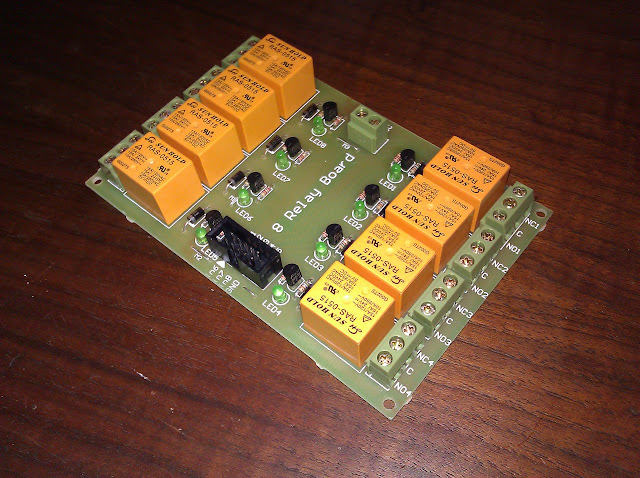 Another piece of the puzzle arrived over the weekend: a relay board that can be driven from a microcontroller. There are eight relays on this board that can pass up to 10A of current at 120VAC, or 10A of current at 24VDC. Fed by an external power source to control the relays and power the indicator LEDs, the eight channels can be switched independently and can be configured as normally-closed or normally-open by selecting a different binding point. I will be using this relay board to switch into the circuit, different filament voltages for the tube heaters in my Digital Vacuum Tube Tester project. I expect I will be switching 1V, 2V, 4V, 6V, 7.5V, 12V, 50V and 120V to use for the tube heaters in a normally-open configuration as those are some of the more common tube heater voltages. All AC, although I will likely add a switch-selectable option (not programmed) for a rectifier and filter after the relay board to convert the AC heaters to DC. This board came from a Bulgarian eBay store, and took the better part of 2 months to arrive, but looks like it’s decently constructed and should be reliable for some time to come. This entry was posted in Electronics, Projects, Radios and Tubes and tagged board, digital tube tester, relay. Bookmark the permalink.